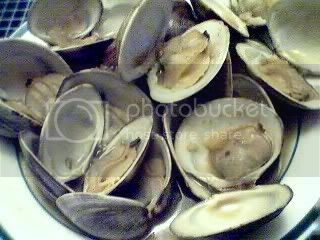 Ever since I saw Sassy’s Halaan recipe, I have been hankering for some clams. I found these clams at Costco and decided on impulse to get a bag since I was buying pizza for the kids anyway. I never know what they’ll eat, so I always try to have a back up. Well, I knew the Clone would not even come near these, so no question there. Anyway, by the time I got home, I got to thinking, maybe I’ll make clams with black beans instead. It may go over better with my hubby who is not so much into soupy dishes. But, it was not to be. When I looked in the fridge, I found I was out of fermented black beans. So I was back to the Sassy’s recipe; I had all the ingredients on hand, except for the sili leaves. Although that soup would hit me in just the right spot, I still had to admit that it would be a hard sell for my hubby. So what I have here is a cross between the two versions. Not quit soupy, but not quite the Chinese sautee either. Heat the oil and sautee the garlic, ginger, and onions until fragrant. Add the clams, oyster sauce and wine; cover and simmer just until the clams open. Sprinkle with black pepper, and remove from heat. Serve immediately, either over steamed rice (my version), or with garlic toast (hubby’s version).